Wasting a couple of hours on Google Earth is usually a lot of fun. I check out the street views on places I am going, so I know what to expect. I go back and look at places where I have been. I toggle layers on and off to see where the precipitation or cloud cover is occurring. And I check my placemarks: memorable places I have been over the years. Occasionally Google will update the imagery and I will see something new. What fun it is to zoom in on my old college dorm and trace that familiar path to the student union, or look at the pool at the off campus apartment where I ogled women in shapely bikinis. I can zoom in on our old family house in Ormond Beach, Florida where I finished my teenage years. It’s all virtually there in Google Earth, including the house in Scotia, New York where I spent my infancy. Many of my old haunts come with very welcome street views. 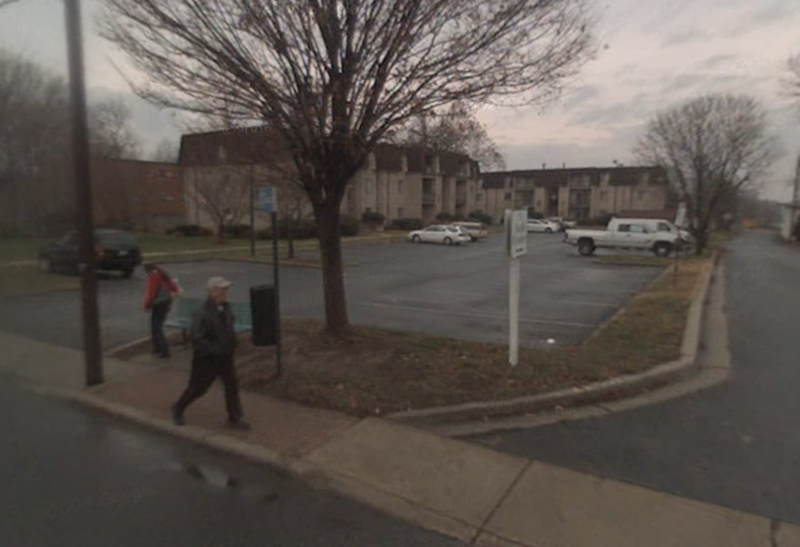 Over the weekend, I used Google Earth to revisit my old apartment complex across the Potomac River in Gaithersburg, Maryland. I can drive there in about an hour, but in the quarter century since I moved out I have actually revisited the place only a couple of times. The nice thing about Old Town Gaithersburg is that it hardly ever changes. There is the train depot and Winkler Automotive across the street. There is the Diamond Drug on the corner of East Diamond Avenue and Summit Avenue. The only thing missing is the Ty Gwyn Apartment Complex, on 330-334 East Diamond Avenue, where I spent five years. It’s gone. Demolished. Bulldozed over sometime last year. My heart sank. My home was gone! I lived at 332 East Diamond Avenue, Apartment 13 for five years, from 1979 to 1984. It was my first real home out of college. It was my bachelor pad, of sorts. I say “of sorts” because while I was a bachelor, I was not one of the moneyed kinds. I was more like the nearly impoverished kind. From 1979 to 1981, I worked at a Montgomery Ward in Gaithersburg selling lawn and garden equipment. Wards of course went out of business, finally succumbing to total liquidation in 2000. (It still has an online catalog store, when the brand was purchased.) So while in the Ty Gwyn Apartments, I had always had a roommate, principally Randy, a guy about my age with long curly blond locks, who did carpentry and ran marathons in his spare time. This kept my share of the rent to around two hundred bucks a month. I didn’t need a vacuum. Rose, the chain-smoking landlady with the flaming red hair was glad to loan me hers when the need arose. I might have stayed in the Ty Gwyn Apartments forever except I met my wife while living there, and we eventually decided to cohabitate across the river in Reston, Virginia. I left but sort of assumed the old ’hood would always be there largely unchanged, much like the Triple Cities where I spent my formative years. Spending five years anywhere, particularly as a young adult, is a long time. Gaithersburg became my adopted home. My garden apartment was in fact nothing terribly special, but it was reasonably clean and functional. The balcony overlooked a much less attractive set of brick apartments next door. During the day you could hear the squeals of school children from the elementary school that boarded the property. When there were not squeals, there were the much louder whistles of locomotives hustling through town. You got inured to it after a while, but the noise was always deafening, even living across the street in an apartment with the doors and windows shut. Windows shook and floorboards rattled. Old Town Gaithersburg was convenient. A Ride On bus stop was right on the street. There were times I needed it as I started out without a usable car, but I could easily walk or bike most places. A MARC commuter train could take me easily into D.C. There was a small grocery down the street, and Lake Forest Mall was about a mile away. Being of modest means, I often commuted by bike. If I wasn’t working, I looked forward to a fresh and hot pizza from Angelo’s on Friday night. It was always delicious. If I needed milk, it was a short walk to the High’s where I often bought a box of Entenmann’s as well. I was poor and mostly loveless, but those days in Gaithersburg were pretty good in retrospect. At least life was uncomplicated. Some part of me wants to return to Gaithersburg and live there again, in spite of the prostitute who I learned later catered to a discreet clientele in a room above the drugstore. But, I won’t be able to go back to the Ty Gwyn Apartments. It is history and now exists only in my mind and in some ephemeral Google Earth street views. It and the apartments next door have been demolished to make room for a new, more yuppified Old Town Gaithersburg. The city no longer wants a real old town; it wants the image of an old town. You know what that means: new and upscale apartments and condos, with wide sidewalks full of eateries, and parking decks. The new buildings have HUD approval, but I’m betting not one of these new fancy apartment buildings would actually be affordable to someone who made as little as I did when I was living there in my early twenties. Frankly, it’s too nice for the looks of people like me back then. For I was one of the working class, East Diamond Avenue was our neighborhood, and the living was unsophisticated but enough. It was a neighborhood without pretensions, where you got by, where you did not offend your neighbors, and where geniality reigned. This included a retired couple on a government pension one floor below me who (set your watch to it) made love every Wednesday night at nine o’clock. I never heard the husband but the oversized moans from the wife always culminated in loud ecstasy. They then remained quiet until the following Wednesday night. Until recently, I could visit the old ’hood. Now it’s gone. It’s going to be newer and shinier while somehow also looking sort of quaint and oldish. There will be virtually no working class people living there but there will be more people there: the upwardly mobile and more-moneyed kind, who won’t park in the lot but in the parking deck, who won’t buy a gallon of milk at High’s (it’s gone) but will buy an overpriced Iced Coffee with Milk at the Starbucks on the street level. The neighborhood’s independently owned Angelo’s Pizza is long gone but there is a Vocelli’s franchise down the street. The new Old Town Gaithersburg thus will look a lot like new Old Towns everywhere, with its character largely squeezed out and young urban professionals squeezed into new loft apartments instead. However, their higher income levels will fill the city’s coffers with doubtless desperately needed funds. For me, I just sort of grieve. It’s gone. All that remains is some rubble and a fading Google Earth street view. Perhaps the Diamond Drug will still be there and independently owned, but I am betting CVS will soon buy it out.